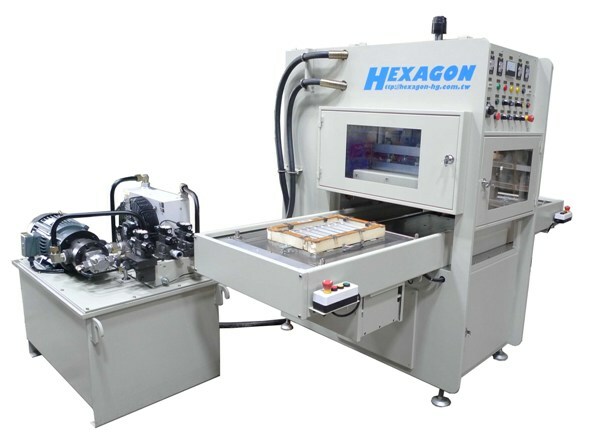 High Frequency Plastic Welding Machine � Sliding tray type high frequency weld cut machine. The sliding tray type weld-cut machine is suitable for welding-cutting materials which contain non-woven, other fabric, and textile or leather products. It enables to cut exceeding material right after welding. Operator will first place the application on the sliding table, and then the sliding table moves in to the pressing area for welding. This design and ensure safety for the operators. The other common use is for blister welding. Sliding tray weld-cut machine can weld blister with cardboard, and then cut the blister. This type of machine is also commonly seen in sport shoes industries. 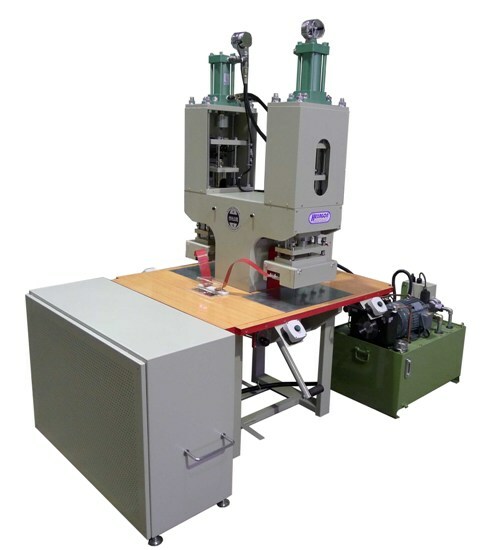 High Frequency Plastic Welding Machine � Foot paddle Hydraulic type weld cut machine. The foot paddle Hydraulic type weld-cut machine is suitable for applications which contain printing on the material. After screen printing or thermal transfer, the applications need to be aligning manually. Suitable product such as, logo printed leather, sport shoes surface, etc. High Frequency Plastic Welding is also known as hot-melt and high frequency heat sealing. The principle of high frequency welding machine is similar to the microwave in our kitchen. When the high-frequency wave is applied, it excite the polar molecules of plastic materials thus generate heat. These heated molecules will flow around when pressure is applied and bond together after cooling. The molecular structure after such a high frequency procedure will become more robust than the original. High-frequency plastic machine typically operate under frequency of 27.12MHz and 40.68MHz. Keywords: TPU TPU hot melt adhesive high-frequency high-frequency bonding foamed PVC plastic cloth embossed TPU tarpaulin TPU film high-frequency fusion of high-frequency high-frequency voltage hot-melt coating TPU TPU TPU fit high-frequency high-frequency hot press lamination high-frequency high-frequency voltage high-frequency TPU branding embossed TPU green material high-frequency welding equipment.